I've been making a lot of the same dishes over and over again lately. Roasted veggies have been my go to because they are so easy and I can do the prep ahead of time. I have roasted veggies down to a quick and delicious science. I usually have lunches under control. Wraps, roasted veggie bowls with guacamole, soup (my friend Jen recently introduced to Soup Solution so now my freezer is stocked with delicious and healthy soups), or hummus and veggies are typical lunches for me. Dinner, on the other hand, always throws me off. I usually think of Tacos, Pasta... I don't know. I'm just horrible at coming up with dinner ideas on my own. I have a few cookbooks that are my go to's when I am trying to get inspired with dinner ideas. Some nights I will use these to try to get some inspiration on ways to use the food I have in my house and other days I will be organized enough to pick up groceries for a recipe I want to try. I also use Pinterest but there is something about flipping through a physical cookbook that is really comforting for me. Clean Slate: This book focuses on using whole foods in interesting ways. There is a variety of plant based recipes and then some fish and chicken as well. I have found some really great juice and smoothie recipes in here. It's also where discovered a delicious beet, avocado and arugula salad recipe and of course I love the fish tacos, because tacos. Eat Smart: I have loved Niomi Smart's YouTube channel for quite a while. She will often show plant based recipes that she makes and while I don't eat solely plant based, I have been finding myself more drawn to more plant based recipes lately. Her lifestyle as a whole is so healthy and motivating so when I saw she had come out with a cookbook I was really excited to try it. It didn't seem like it was available in Canada so I asked my brother if he could pick it up for me on his recent trip to London. (I just checked and it does look like it's orderable on Amazon.ca now which is great). I haven't made anything from her cookbook yet but it's really inspired me to get cooking! Oh She Glows: Angela Liddon takes recipes we all know and makes them plant based. The baked oatmeal and glo bars are just perfect and so easy. I also have her app which is honestly one of my favourite things ever. She also has a new book out which I'm excited to flip through! 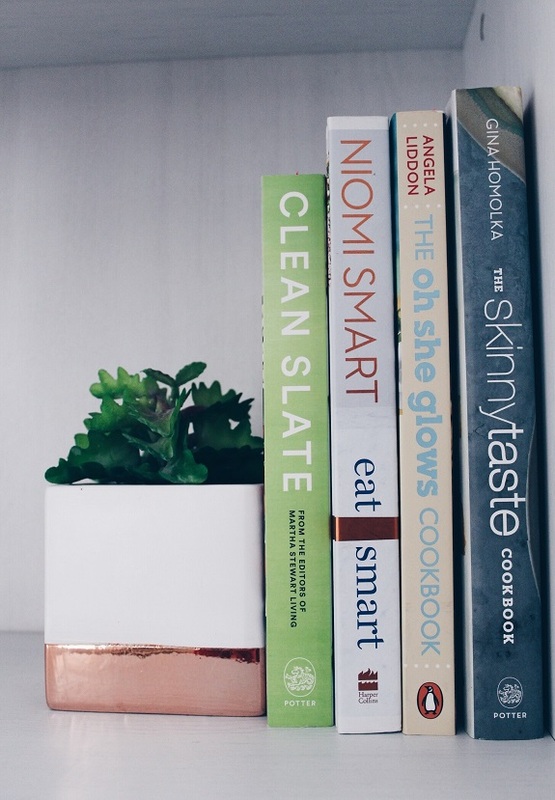 Skinnytaste: The skinnytaste website is honestly such a go-to for me so I had to pick up Gina's book. It's full of recipes we all know and love but they are made a little bit healthier. Kevin and I eat differently so this book is perfect because I am still making food he loves but it's just a little healthier for me. Gina also has another cookbook out and if I remember correctly it has a lot of slow cooker recipes which sounds right up my alley. I'll have to give it a look!